After getting back from the errand and getting everyone situated for our afternoon Quiet Time, I mixed up the banana bread batter and stuck it in the oven. I’ve made a lot of various banana bread recipes over the years, but this recipe is hands-down the best one ever. Like the Pumpkin Chocolate Chip Muffin recipe, I wouldn’t say it is the most healthful banana bread recipe ever invented, but it sure is delicious! Plus, it freezes exceptionally well and makes for a quick and easy snack or breakfast. I usually let the bread cool, then slice it, and stick it in a freezer bag in the freezer. We just pull out slices as needed. I often will pack a few slices for a snack if we are heading out for a few hours so we’re not tempted to run through a fast-food drive-thru lane for a quick snack. Stir together dry ingredients. Beat together remaining ingredients. Add wet ingredients to dry ingredients and blend until just combined. Pour into greased loaf pan and bake at 350 degrees for 1 hour and 15 minutes or until toothpick inserted into the bread comes out clean. Cool in pan for 10 minutes and then transfer to a wire rack. After the banana bread was mixed together and in the oven, I made up the waffle batter and started baking waffles while I mixed up the Blueberry Streusel Muffins and cleaned up the kitchen. 1. Do you ever make hot dog buns or hamburger buns? I use my bread machine to start the dough. Then I shape them and let them rise one more time and bake! 2. How do you freeze your breads? Zip-Locs, plastic? Your waffles look like they came out perfect! How long do you leave each one in your waffle iron? Oooh, banana bread! 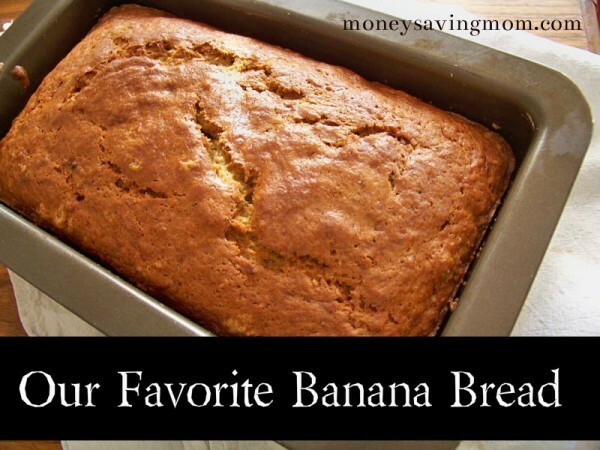 Meijer has bananas at 39 cents a pound this week, I should get some extra and make banana bread to freeze! 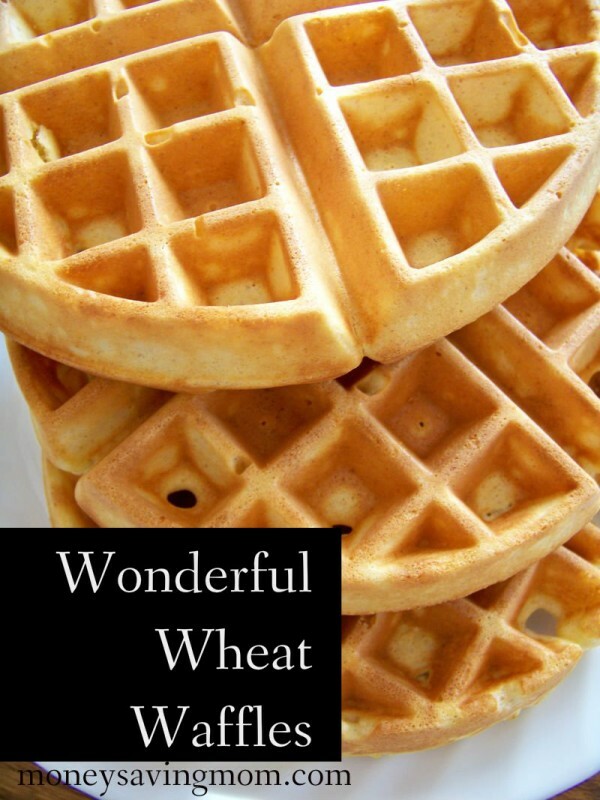 Those waffles look so nice and golden! Your Banana Bread recipe is the same one my Gramma passed on to me years ago. I have to agree with you, I’ve never tasted a better one. Everything looks so yummy. I wish Ihad the time to do some baking. Maybe in a few weeks I can get some done. It has been awful hot here and I told my daughter do not turn on the oven! I used to make similar kind of cake but I used to add a cup of powdered sugar and butter. That’s a great idea about slicing the bread before freezing. Thanks! I really like this recipe for Banana Bread and have shared it with others. One thing I did to make it a little healthier is to substitue half of the oil with applesauce. Works very well and is still nice and moist. HELP! Im making the banan bread right now and just realized I only have half the oil serving- and I have no apple sauce! What can I use instead? I am truly amazed at what you do with three small children (an infant, no less). I am not even sure I did anything productive when my children were so young… just cleaned up a lot of messes, I think! Anyhow, a question about waffles. We make Belgian waffles for dinner from time to time. Fresh out of the iron with strawberries, whipped cream and syrup… hard to beat! I too make up any leftover batter and put the waffles in the freezer but, we don’t think they are as good when we toast / microwave them. How do you prepare your frozen waffles?? I made the banana bread yesterday and love it. Great recipe. Thanks!